This report is divided into two parts. The first part will explain how a standard costing system works and how a variance analysis is used properly. Furthermore, the statement “Standard Costing and Variance Analysis are appropriate to any type and size of organisation” will be critically evaluated. The second part determines factors, which must be considered in the decision-making process. In addition, four scenarios of decisions will be provided and analysed. One of the main objectives of an organisation is to minimise the cost of production and to control the costs as they are limited resources within a business (Gupta, 2010). Management accounting literature provides several tools in order to achieve these objectives. In this context, the system for collecting and reporting revenue and cost information by areas of responsibility is called responsibility accounting (Siegel & Shim, 2006). It is based on the assumption that managers should be held responsible for their performance. A well-designed responsibility accounting system integrates responsibility centers within the organisation. In addition, responsibility centers are units within the organization, which have control over costs and revenues (Siegel & Shim, 2006). There are different types of responsibility centers such as profit centers, investment centers, revenue centers and cost centers. In the following report, the focus is on cost centers. Here, a variance analysis based on standard costing is a performance measure of a cost center (Siegel & Shim, 2006). In addition, a standard costing system is a useful tool facilitating decision-making. In a standard costing system, predetermined estimates of the costs of products and services will be established and then compared with the actual costs as they are incurred. Predetermined costs are standard costs, which should be incurred under efficient operations (Drury, 2009). The difference between the standard costs and the actual costs is known as a variance. Here, it is to point out that standards costs are not the same as budgeted costs. The principal differences between them lie in their scope. Both are concerned with laying down cost limits for controlling. However, budgeted costs impose limits to total cost for an organisation and standard costs are attached to products and to individual manufacturing operations (Glautier, 2011). As indicated, standard costing systems are applied in cost centers where “the output can be measured and the input required to produce each unit of output can be specified” (Drury, 2009, p. 277). Therefore, standard costing is most suited to organizations such as manufacturing companies where activities consist of a series of common or repetitive operations. It also can apply to service industries such as transport, computing and banking (number of cheques) and to parts of the public sector (street cleaning, refusal disposal) (Lucey, 1996). In addition, organizations that produce a wide range of products can use a standard costing system as long as the manufacturing consists of a series of common operations. In the example below, standards cost will be established for repetitive operations. Product standard costs are then derived by combining the standard cost from the operations that are necessary to make the product. Here it is to point out that not the standard product cost will be compared with actual product cost but the actual costs for cost center A will be compared with the standard costs of center A since cost center A is responsible for the variance. However, standard costing cannot be applied easily to non-repetitive activities, since “there is no basis for observing and recording operations and standards cannot be set up” (Drury, 2009, p. 278). In this context, to be effective in the purpose of cost control standard costs must be set up which is based on a careful analysis. Here cost standards must be set up for all categories of costs and for all cost centers. According to Drury (2009), standard costs can be set up following two approaches. Firstly, historical records can be used in order to estimate labour and material usage. Secondly, engineering studies about each operation, which are based on careful specifications of material, labour and equipment, can be used to set up the standard costs. Due to this, because of their wide knowledge engineers are often involved in setting these standard costs. It must be mentioned that using historical records might include past inefficiencies. Nevertheless, this approach is compared to engineering studies less time and cost consuming and widely used in practice. In order to set up standard costs for material three things must be known about the material inputs: what types of inputs are used; what quantity of inputs is used; and what quality of inputs is used (Barfield, 1997). Usually specifications for materials, including quality and quantity, are recorded on a bill of materials. This bill states the exact quantity of materials for each operation completing a product (Drury, 2009). In addition, managers should seek the advice of engineers, cost accountants, material experts or suppliers in making quality decisions. After the standard quantities are established prices for each material component must be set up. The standard prices are obtained from the purchasing department that knows best what supplier provides the most appropriate material in the most reasonable time span at the most reasonable cost (Barfield, 1997). The standard costs for material are then calculated by multiplying the quantity standard that should be used per unit by the standard price paid for each unit. The process of establishing direct labour standards is similar to as those for material. Each production operation performed by workers will be analyzed in order to determine the number of standard hours required by an average worker to complete the job (Drury, 2009). Activities such as cleanup, setup, and routine maintenance are included in the standard time. However, all unnecessary movements by workers should be disregarded because as shown in the graphic a worker´s day is not spent in entirely productive work (Barfield, 1997). The standard hours will be then multiplied by the standard labour cost. Furthermore, an overhead standard rate is the predetermined overhead rate, which is a “budgeted and constant charge per unit of activity that is used to assign overhead to the period’s production” (Barfield, 1996, p. 163). This rate represents an expected cost per unit of activity. To calculate a predetermined overhead rate, the organization divides estimates future overall costs at a specific level by that activity level (Raiborn, 2009). The standard overhead rate is usually based on a rate per direct labour. Moreover, according to Drury (2009) separate rate for fixed and variable overheads are important for planning and control. Here, variable overhead costs vary directly with output and the variable overheads will be applied to actual output in accordance with the predetermined rate. In contrast, fixed costs do not vary with output an due to this a standard output must be budgeted in order to calculate a fixed overhead rate (Glautier, 2011). After the standards for direct material, direct labour, overhead has been set up a standard cost card as shown below is prepared. The standards within a card must continuously be reviewed in order to ensure that the standards reflect current targets (Drury, 2009). Furthermore, the standards provide now the basis for a detailed variance analysis. The standard costs mentioned provide a basis against which actual cost can be measured and variances calculated. A variance analysis is “the process of categorizing the nature (favorable or unfavorable) of the differences between actual costs and standard costs and seeking for explanations for those differences” (Barfield, 1997, p. 470). In context, unfavorable variances arise when the actual expenditure exceeds the standard allowance and favorable variances arise when the actual expenditure is less than the standard allowance (Glautier, 2011). A variance analysis should help managers to determine who or what is responsible for each variance. Furthermore, it is important for managers to know when to act and when it is not necessary. Due to this, managers establish upper and lower limits of acceptable deviations from standard as show in the graphic. If variances are within the acceptable range, managers must not take actions. However, if the actual costs are significantly different like occurred in Day 6, the manager have to find the cause. Setting upper and lower limits for deviations allows managers to implement the management by exception concept (Barfield, 1997). 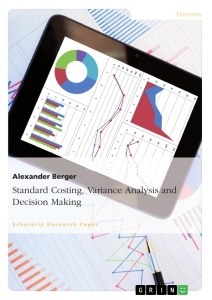 Summarized according to Glautier (2011) the control of direct cost through variance analysis is based on two principles: Management by exception and accounting responsibility. Please see appendix to find a variance analysis. There are many advantages of a standard costing system. A well-structured system defines the variance from standard by causes and responsibility centers and provides management with cost information in order to exercise cost control and initiate corrective measures (Rajasekaran, 2010). In this context, it facilitates management by exception. In addition, it provides a prediction of future cost that can be used in decision-making such as pricing- decisions (Drury, 2009). Employees within an organisation also become more conscious of costs because the responsibility for favorable or unfavorable performance is indicated (Banjerjee, 2005). Furthermore, because cost centers define clearly who is responsible for each center, it is easier to find out who is destined to be responsible. Standard costs are also suitable for inventory valuation as well as they provide a reliable source of data for budget preparation that facilitates planning (Drury, 2009). Moreover, cost standards might provide a challenging target to employees. This can increase the work efficiency of employees because they are motivated to achieve the standard targets. Standard costing also allows a continuous re-appraisal of the method of production leading in the long-term to cost reduction. Nevertheless, there are disadvantage an organisation has to be aware of. The establishment of standards through engineering studies requires a high degree of technical skills and is therefore time consuming, costly and difficult in practice. Furthermore, in industries that are exposed to frequent changes in processes and technology or in the quality of material, standard costing becomes ineffective (Banjerjee, 2005). Here, frequent revision of standards is costly and difficult. In addition, variances are determined and analyzed after the activity is completed which might be too late to initiate corrective measures. Furthermore, standards might lead to an adverse psychological effect. Not achieving the standard targets because they are at high level might lead to frustration among the employees. The statement “Standard Costing and Variance Analysis are appropriate to any type and size of organisation” is not true. As Drury (2009) stated “standard costing cannot be applied easily to non-repetitive activities, since there is no basis for observing and recording operations and standards cannot be set up” (Drury, 2009, p. 278). Therefore, a standard costing system is not appropriate to organizations where the production process is based on non-repetitive activities. Furthermore, establishing standards requires time and is very costly. Due to this, for small organizations it is often difficult to establish a standard costing system because of their limited financial resources. Moreover, standard costing was developed when the business environment was more stable and less vulnerable to changes. However, nowadays the business environment changes so rapidly that it is difficult to set standards for management control purpose throughout a year. In addition, the increasing automation of manufacturing processes led to a decline in direct labor costs and therefore to a corresponding decline in the importance of labor-related standard cost and variances (Needles, 2007). Therefore, manufacturing companies such as Kraft or Boeing are not using the traditional standard costing system anymore. They readjust this system only by using direct materials and overhead standards. Furthermore, in order to remain competitive in today´s environment many organizations focus on quality and customer satisfaction. However, the standard costing is more focusing on minimizing costs. Japanese production techniques such as Just-in-time and total quality management are more appropriate nowadays to many organizations because they meet the corporate objectives more effectively.